One of the most common questions that I receive about SEO is whether you should have comments on your website and/or engage in trying to get comments on your blog/website. I’m here to clear up a lot of misconceptions in regards to comments and SEO. Spoiler alert: Comments aren’t the measure of success that many people think that they are, but they can help your SEO. Should you have comments on your website? Is it worth engaging in comment threads? It depends on your website, however not every website needs to have a comment field. If you have an industry website and don’t post blogs, there really isn’t a need for commenting. However, if you post blogs and/or publish informational pieces, comments can be a good way of engaging with your audience. Yes and no. It used to be in the “old” Internet that when you commented on a website or blog that you received a follow link (a good thing!) if you put a link down. (A few websites still have this archaic practice.) You can imagine that it’s easy to abuse this system. As a result, most websites have comments with nofollow links at this point and I recommend nofollowing comments to discourage spammers. Spammers often use commenting as a method of attempting to link build for their website. For a high DA website, a comment with a nofollow link can actually help your DA a bit, however in general, there really isn’t a need to comment with your website link/name at this point in time. It’s also considered spammy by many although many bloggers often do this. 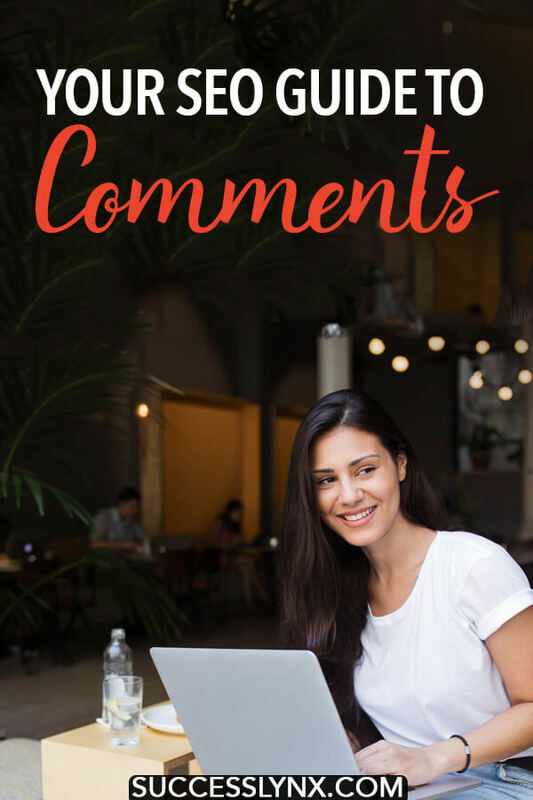 In general, commenting can be quite beneficial for blogs SEO-wise as a popular post that receives many comments can actually rank for some of the writing within the comments. A popular (and controversial) post of mine has received 104 comments at this moment with an average of 500-1000 words being added monthly in comments. This post ranks for some of the keywords in the comments, which is insane to consider, as I never wrote about these topics. If your goal is to get feedback from your public, you want to make it easier. Increasingly, many websites force people to log-in with Facebook, WordPress, or another platform that requires a log-in to comment. It’s too much work. For many commenters (myself included! ), they do not wish their comments to be publicly tied to their Facebook profile. If you’re concerned about Internet trolls, it might be worthwhile to have Facebook commenting although you’ll most likely receive fewer comments in general. Similarly, many people won’t comment if they need to log-in to another platform just to comment. The most basic method of requiring a name and an email is usually enough. Let’s be clear here: I’m not talking about positive and negative comments. I’m interested in useful and spammy comments. There are comments from real people interested in your content, comments from people only there to sneakily promote their own content, and comments from bots. It took me a while to figure out that some people were commenting solely for the purpose of sneakily promoting their business in the comments, however I’m keenly aware of it now. In general, I don’t allow any comments to have links. With WordPress, you can go to Settings -> Discussion prior to checking off the Comment author must fill out name and email option as well as using the comment moderation/blacklist effectively. I force any comment with more than one link into my spam inbox, which saves me a lot of time. I also disabled showing Avatars, which enables my website to load faster. I also love the plug-in Comment Link Remove. This plug-in removes the incentive of spammers to comment just to have a link from your website as there’s no website link field, which is the default with WordPress. Spammers often abuse this by posing as fake individuals, occasionally writing thoughtful comments. It’s very popular within various social media groups to do commenting groups, however overly positive and/or vague comments from others within your community can leave some with the impression that your comments are fake. That said, I find that it’s very important to network within your community and a good way to be recognized by as an expert is to have others reading content on your website. Depending on your niche, it might be beneficial to have others commenting on your website. I generally recommend waiting for the legitimate comments to roll in and screening out comments from those who didn’t read your content. Personally, I screen comments to remove links to not be self-promotional if I feel like someone has read my content, but they’re only on my website to promote their own website. At this point, I don’t bother with commenting threads, but I understand why others like getting feedback on their websites from others in the community. Any other questions about comments and SEO?